One of my Japanese customers felt it was time to show his support for the world soccer cup.Hence the football design,and so this little 5'6"beauty will tearing it up in Japanese waters pretty darn soon. 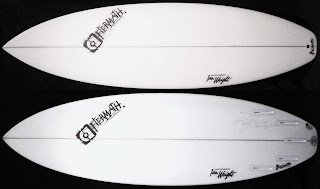 This little screamer came from a blend of a few boards for one of my team guys.We had been toying around with some designs and dimensions and after scaling down his regular 6'2" x 18 1/2" x 2 1/4" epoxy shorty,we came up with this 5'10" x 19 1/2" x 2 5/16".Using a combo of my PR-M2 bottom rocker,more relaxed in the nose with the wider tail outline and a slightly more pulled in UFG nose and standard PS shorty rails.Throw in the 5 er Future fin combo and out popped "The Dreamer".I'm sure there'll be more variations coming from this as we test these out in the next few months.Stay tuned!! 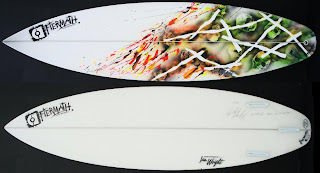 Look for some cool new board sprays coming very soon!! !